Citrus fruits such as lemons, limes, oranges and grapefruits contain citric acid and have a pH range between 2 and 6 -- pH is the scale that determines how acidic or basic a substance is with neutral having a pH value of 7. Human blood, for example, is slightly alkaline at 7.3 to 7.4. 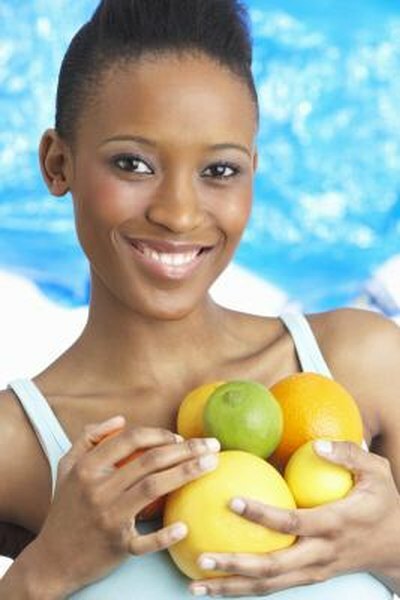 The amount of citric acid in fruits can be simply measured with pH test strips that can be purchased at most pharmacies. Cut the fruit in half with the knife. Swipe the pH test strip across the surface of the fruit interior. Make sure the strip gets wet from the fruit juice. Wait 30 seconds and note the color change of the test strip. The color change will be different for each fruit tested. Compare the color on the pH test strip to the chart that came with the test strip packaging. The colors between the two will not be an exact match so make an approximation to determine the fruit's pH level. Run a second test to confirm your results. Test multiple pieces of fruit as the pH will slightly change based on the fruit variety, age and sugar content. Use caution when cutting a round fruit such as an orange -- as the blade will have a tendency to slip off the surface unless the knife is sharp. Why Is Sorbic Acid Added to Foods? What Is a Low Level of Vitamin B12?